Gosh, that’s gone quickly. 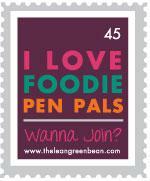 It’s time for another Foodie Penpals show and tell. This month I was paired with Alice from Denmark. I sent a parcel to Deon in South London which had a mix of local oddities (Tamarind sweets) and personal favourites (Nut bars and the like). 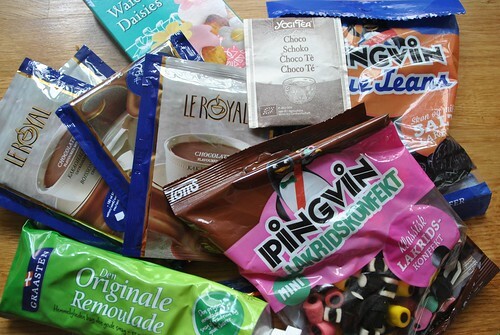 Alice tells me that the contents of the parcel, particularly the liquorice sweets are a typical danish treat. Does anyone have any experience of baking wish liquorice? Origional Remoulade – This is apparently usually used on fish but can be good on meat too. It looks like a tartar sauce I think. Yogi Choco and Choco Chili teas – Taste like hot choc but less sugar and easy to take to work. I have seen these in Holland and Barrat but just assumed they’d be like herbal teas and be rather insipid. I was wrong – they taste great and I’ve now bought some more. Some Dr Oetker wafer daisies – love that these are in Denmark too. A bag of wonderfully named Toms Pingvin Lakridskonfekt which seems to be tiny Liquorice Allsorts. A bag of Toms “Pingvin Blue Jeans” which look like the biscuit part of mini oreos but are infact salted liquorice. I adore the European parcels the best! This ne looks like fun! !